Great Lakes Books Series, 9780814339510, 264pp. Throughout World War II, Detroit's automobile manufacturers accounted for one-fifth of the dollar value of the nation's total war production, and this amazing output from "the arsenal of democracy" directly contributed to the allied victory. In fact, automobile makers achieved such production miracles that many of their methods were adopted by other defense industries, particularly the aircraft industry. In Arsenal of Democracy: The American Automobile Industry in World War II, award-winning historian Charles K. Hyde details the industry's transition to a wartime production powerhouse and some of its notable achievements along the way. Hyde examines several innovative cooperative relationships that developed between the executive branch of the federal government, U.S. military services, automobile industry leaders, auto industry suppliers, and the United Automobile Workers (UAW) union, which set up the industry to achieve production miracles. He goes on to examine the struggles and achievements of individual automakers during the war years in producing items like aircraft engines, aircraft components, and complete aircraft; tanks and other armored vehicles; jeeps, trucks, and amphibians; guns, shells, and bullets of all types; and a wide range of other weapons and war goods ranging from search lights to submarine nets and gyroscopes. Hyde also considers the important role played by previously underused workers-namely African Americans and women-in the war effort and their experiences on the line. Arsenal of Democracyincludes an analysis of wartime production nationally, on the automotive industry level, by individual automakers, and at the single plant level. For this thorough history, Hyde has consulted previously overlooked records collected by the Automobile Manufacturers Association that are now housed in the National Automotive History Collection of the Detroit Public Library. 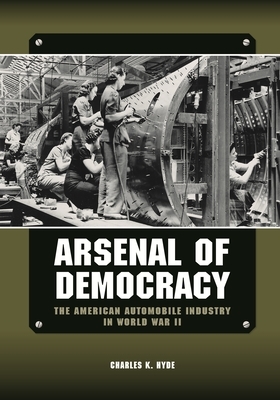 Automotive historians, World War II scholars, and American history buffs will welcome the compelling look at wartime industry in Arsenal of Democracy. Charles K. Hyde is professor emeritus of history at Wayne State University. He is the author of Storied Independent Automakers: Nash, Hudson, and American Motors (Wayne State University Press, 2009), The Dodge Brothers: The Men, the Motor Cars, and the Legacy (Wayne State University Press, 2005), and Riding the Roller Coaster: A History of the Chrysler Corporation (Wayne State University Press, 2003).